As you may have already come to know, Nicole Falls is my girl. She's my sister-friend in my head. She just gets what I'm looking for in a book, without even knowing it. Of course, she didn't write this book specifically for me--but it always seems like between her and Christina C. Jones--they know exactly what I'm looking for when I need it. Road To Love was different for Ms. Falls--but it contained the typical humor, and swoon-worthy romance, I've grown to know her for. Emerson's life is just stressful. Sis, is skressed. In an attempt to alleviate her stress--she takes a break from work, to visit her family. Her older sister although overbearing will be the reprieve she's seeking--along with her niece, whom she adores. It's just the parental unit, that she could do without seeing. Roosevelt aka Ro is on the precipice of his grief over the loss of his grandmother--and too, finds himself heading back home--and dealing with his family, even though he'd rather be doing anything but that. Deciding to drive home, and Emerson forced to drive home--the two meet in a "chance," kind of way--and the two find something in the other, they weren't even looking for. This book has the typical Nicole Falls style, but, it's heavier and meatier--than what I've grown used to from her. This is not a complaint, but more of a notice. I see you, girl. Emerson as well as other characters like her, give me life--because they get me, unintentionally. Who doesn't love a book that makes you feel seen? Emerson's internal struggles and even familial struggles are familiar, and I enjoyed seeing how she dealt with it all. While Roosevelt shared a similar experience-- his was a bit more painful with the loss of his grandmother. But the two of them together--was so effortless and cute. It was typical Nicole Falls, cute throwback goodness. I love all of those little moments where we music from my past is brought up in the form of reminiscent moments. It puts me in a happy black space. Thanks for that. I don't think I've said that before, but thanks for recognizing the real. I don't want to give away too much of the book. I know I typically don't, but sometimes it's hard to restrain myself because I want to rant about it in full disclosure--but I want you all to enjoy the experience without all of the spoilers. This is another amazing read from Nicole--I mean did you expect me to say anything different? 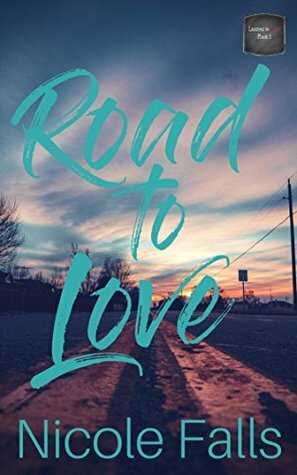 Humorous, while serious, emotional, and at times light--Road To Love is the perfect summer romance--and you deserve this book. PSA: If you didn't bother to read the blurb in its entirety--there will be other books in this series. NOT WRITTEN by Nicole Falls. I won't lie and say I'm not disappointed because I am. But, I'll be checking them out of course.